My family is on their way to visit and we have some hopefully good new recipes to try this week. They are vegetarian so I’m trying three new recipes to branch out a little. I actually stuck to our menu last week and only moved one thing around due to a needed family clothes shopping trip. We also have a little girl turning 5 this week so we have a birthday dinner with little friends included as well. 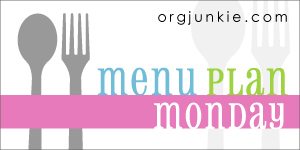 I’m linking this to Org Junkie’s Menu Plan Monday link up. I’ve tried to find the online recipes where possible. For Thanksgiving I’m responsible for Mashed Potatoes, a Green bean casserole and a pie so I’ll be looking at those items for next week. I have definitely fallen off the menu planning wagon and have spent a while kind of having an idea of what we’d eat, or I am checking our pantry to see what we have right before it’s time to eat. For sure we have been eating out more than we should be. We have a long list of house repairs and a travel wish list for 2013 so I’m trying to be better with menu planning in order to help save money to go towards some of those goals. Since I actually made a menu plan (for the next two weeks! *gasp*), I’m joining in on Org Junkie’s Menu Plan Monday link up. Next week we have family in town so my menu will be all vegetarian. Trying out some new recipes for that one.